The last time we saw Toronto powerdelic-pop group Doldrums, they were opening for Grimes at Berlin’s famous Berghain club. Fitting then, that their latest video is directed by Emily Kai Bock, the same director who gave us the fantastic, world-of-her-own video for “Oblivion”. While her latest video may not make us drop our pants the way we did while backup-dancing for Claire Boucher, it does make us drop our jaws with happiness. 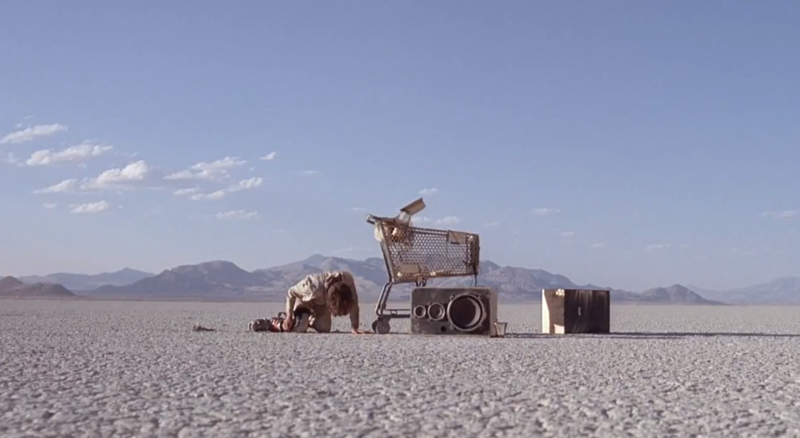 “She is the Wave” finds bandleader Airick Woodhead struggling to push a shopping cart full of technology across the desert. The ski boots he’s wearing don’t help much, but the arrival of a cat-car speeds things along. The only question is: where can we get one of those for ourselves? She is the Wave” is available on the Doldrums LP Lesser Evil, out 22nd, 2013 on Souterrain Transmissions (Europe) / February 26th on Arbutus Records (North America).